Today when mobile marketing is so developed, app store has became a competitive platform among many applications. With this everyday developing platform and with users who download about 4-7 apps monthly, how can you be sure that your app will attract their attention? Here are 5 app store optimization(ASO) tips you should take into account when creating or modifying your application. This is #1 thing you should think about while designing your app. It’s of the utmost importance, as it tells users about the purpose of your app. You application name should be connected to your business, should be relevant to what users search for and should have the right keywords. Using suitable keywords in the app name and description will increase the likelihood of an application being ahead of its competitors. You should think of 7-9 keywords that would apply to your app, but remember also that more than 30 characters are not allowed in app title. The perfect example of a good application name is the one of Busuu. It’s a good app name, as it contains many searchable keywords. 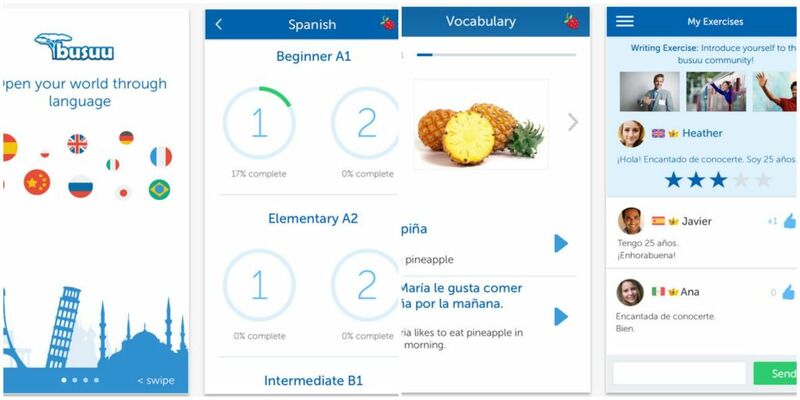 If one wants to learn English, Spanish, French, German, Italian or other language, they will use these words to search for the applications, and this one would be one of the first ones to appear in app store. As we have mentioned in the previous point, the keywords have a huge importance, so you should follow these steps to use them correctly. They keyword field is 100 characters in length in the app store, so your keyword should be less than 100 characters. Don’t use spaces in your keyword. Separate them with commas. While selecting keywords concentrate on relevance to the application and diversity..
Use singular keyword instead of plural. Don’t use “offices”, use “office”. App icon represents you and your brand image. Poor icons are the main reason why many apps fail. So, you should make it eye-catching, in order to make users click on it. Here are some tips to use in order to have a perfect icon. The icon of our example mentioned above is a good representation of a perfect icon. App Store requires at least one screenshot, however you can add other 4 screenshots if you want. Screenshots are another way of promoting your mobile application. Like the icon, it should also be clear and highlight the advantages of your app. They should show a clear overview of the app’s functionality.You can add a text to better explain your app's advantages or you can link some screenshots to tell a story. The screenshots of our example Busuu are just perfect, as they give us a clear understanding about the functionality of the app. Without description, users cannot fully understand what you offer them. So, put the most important and relevant information about your app at the beginning of the description Here are some information you should put in it. Reasons to download your application and proofs that it is better than other competitive ones. Recent updates, which were made to your app. Locations where your app operates. Here are 5 ASO tips which will help you position your application higher than your competitors. Do you have other tips? Share them with us in the comments below.